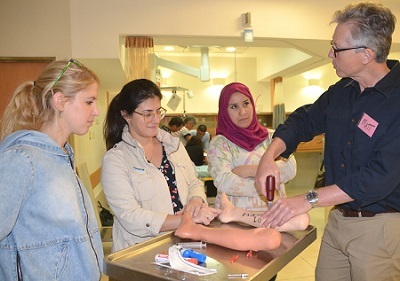 Eighteen doctors and nurses from Israel, the Palestinian territories, Gaza and Iraq recently attended a course on pediatric emergency health care at Hadassah Hospital Ein Kerem in Jerusalem. Sponsored in part by the Peres Institute for Peace, the course was organized and run by a medical team from Sydney Children’s Hospital (SCH) in Australia at the invitation of Hadassah pediatrician Dr. Saar Hashavya. After a fellowship at SCH, Dr. Hashavya returned to Israel determined to build bridges between health care professionals from different countries. Photo above: Dr. Matthew O’Meara with Israeli and Palestinian students at Hadassah.